Looking to create flowing textures, moving drones and pulsing soundscapes? Then you will love Eclipse for Kontakt by Wide Blue Sound. Eclipse is being billed as the darker sibling to Wide Blue Sound’s much acclaimed Orbit. While being darker, heavier and more aggressive, I still found Eclipse to be a very fun to play instrument that offers a varied palette of both flowing and pulsing sounds. Eclipse tends to be more texture and soundscape oriented with sounds that are often rhythmic and flowing rather than sounding like a synth. Eclipse is very unique and has one of the most innovative Kontakt KSP Scripted interfaces and GUI’s out there. While the GUI offers a wide variety of sound sculpting options, Wide Blue Sound managed to keep Eclipse relatively simple so that messing around with the sound is a very fun and intuitive process. Depending on the mode and the samples the snapshot is using, the sound tends to be more on the drone like soundscape atonal side. Eclipse has 4 layers of sound that evolve over time. These channels are “orbited” in different ways depending on the mode. The modes are PULSE – CHOP – FLOW. Flow Mode for stunning pads and textures. My personal favorite mode is FLOW because the sounds are more pad like and musical in my opinion. PULSE and CHOP as you might imagine are more rhythmic and more atonal in nature. They can make for some great starting points to build musical passages over but are not as musical in my opinion as FLOW. That said – my overall impression is that Eclipse is a wide and deep instrument capable of a huge variety of sounds. It’s really fun to play with the intelligent random and blend different sounds together in the various modes. Eclipse would be even better if there were a larger base of sound sources for the layers. As it is Eclipse only has a collection of 101 core sounds available to use in any of the 4 layers. It’s a rather small library of sounds with the total Eclipse install size coming in at just over 571 MB in size. More would be better. I hate to complain. It’s just I am the type who always wants more! I WANT IT ALL! NO LIMITS! Having only 101 sound sources does limit the possibilities. Plus it would be nice if the sound sources contained within Eclipse offered a few more samples that weren’t as atonal. More synthy pads and musical instrument type sounds (which I am sure that Orbit has more of) would widen the variety of sounds Eclipse could produce. I understand that Eclipse is meant to be more aggressive and darker, and as such the samples are less musical, but because the layering engine they have is so powerful I believe Eclipse could have been even more powerful had they included a few more tonal sounds like synths, strings and pads. Including a few multi-sampled synth type sounds, would make the intelligent randomization even more powerful and yield far more varied results. Don’t get me wrong… I love Eclipse. I just think it could benefit from a larger more varied base of samples. 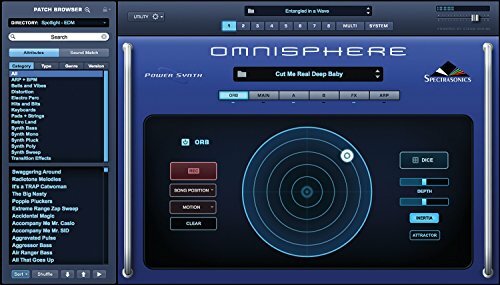 That said – I have a feeling that Wide Blue Sound isn’t yet done releasing versions of this “Orbit engine”. What would really be cool however is a jumbo sized all in one version with more core sounds so we could get even more blending opportunities! Nathan Rightnour & Jeff Rona have done a great job on the Orbital Synthesis Engine and Kontakt Scripting and Interface. Eclipse is truly a one of a kind instrument that is capable of delivering awesome sounds. All in all Eclipse is a great sample library for Kontakt and offers a 250 preset snapshots along with extensive sound shaping possibilities and creative options. It’s very fun to tweak and create your own sounds. It’s fun just to hit random to see what you get. A lot of times the results are very good! I don’t have Orbit, so I can’t say from experience, but I suspect that Eclipse is a great companion. Eclipse stands on it’s own and is a solid value at $149. Eclipse is pretty deep and has a lot of features. I did not cover them all here – but you can check out the ECLIPSE Specs and Audio Demos here. > More info on Orbit and Eclipse at the Wide Blue Sound website.